This blog is about exactly that. Getting to know your underside a bit better! Yes, I know is a remote and personal area, but when it comes to riding, knowledge of your pelvis and how it interacts with your horse is vitally important. For anyone who is unfamiliar with their seat bones, here is a picture of a female pelvis. 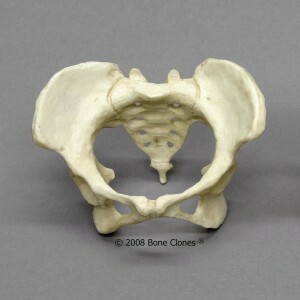 (If you are male, your pelvis will be narrower) The seat bones are the two rounded tips at the base of the pelvis, and we sit on them. They are like the rockers of a rocking chair, in that they have rounded surface. You can sit on the back, middle or front of them. If you are sat on a hard chair as you are reading this, place the palm of your hand under your bottom, palm facing up, and you should be able to feel a seat bone! Now that you are familiar with where they are, move to the edge of the seat, so that your thighs can drop down, and you should have a really clear feeling of your seat bones. If you hollow your back and then round your back, you should be able to feel the contrast between sitting on the front and back of your seat bones. The ideal position is to sit on the bottom, or pointy bit of your seat bones, so that your pelvis is upright, and your spine becomes neutral. Depending on how you usually sit, (maybe you prefer to slouch or perch), finding the place where your seat bones point down, could feel really weird! Refer to Change blog! So, why do seat bones matter so much in riding? Your seat bones are extremely influential in regulating the speed and direction of your horse. When you are aligned correctly in the saddle, they will be positioned directly over the horses long back muscles, and from here you are able to communicate how fast and in what direction you would like your horse to go. With this in mind, all the time your bottom is in the saddle, you are communicating with your horse. The problem is, this communication needs to be clear. Clear enough that the horse knows exactly what you mean. Think of it like an old fashioned radio signal. When you tune into the exact wavelength, the signal is clear and you only hear the broadcast. However, when you can’t tune into the wavelength, all you can hear is ‘white noise’ and it becomes so hard to listen to that eventually you have to stop listening. A pelvis that wiggles and jiggles about in the saddle is just like the radio signal with white noise. The horse can feel all the unnecessary movement from your seat bones, and because he is unable to decipher the signals, his only defence is to switch off and ignore you. Sometimes, we can also be lured into ‘shoving’ with our seats, in an attempt to motivate a horse that doesn’t seem to want to go forward. Guess what? I’m afraid the shoving will just add to the ‘white noise’ and the horse will shut down even more. So, it is necessary to learn how to become more still, and to get onto a close interface with your underside, so that you can begin to create a clearer broadcast to your horse. In fact, you will discover that less is more!! Still doesn’t mean stiff or rigid. It means being able to control your bodies extraneous movements so that you are able to give clear aids, and this requires tone and stability. In part 2 of this blog, I will talk about some on-horse exercises to help you get to know your seat bones better. Fantastic, looking forward to seeing it all in action on 25th April. Thanks for reminding me how important my seat bones are! Good one Sally. Keep up the good work on your blogs. Good stuff Sally, I really like it. Great blog Sally – thank you. Another vital part of upright seat bones is that they are the basic building block for balancing everything else on top, so without the correct angle, everything else above is compromised and becomes an unnecessary effort.